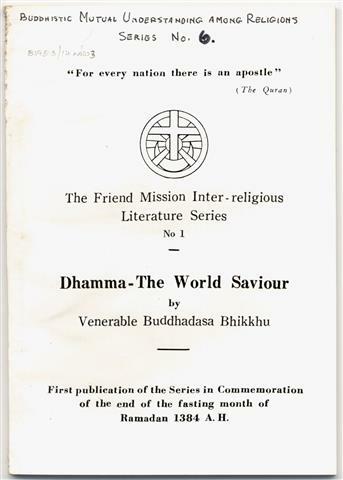 Dhamma - The World Saviour by Venerable Phra Rajjayakavi (Buddhadasa Bhikkhu). A lecture delivered on 7th July 2505 (1962) at US Information Center, Bangkok. Extinction Without Remainder by Buddhadāsa Bhikkhu. Towards Buddha-dhamma: Condensed and freely translated from the lecture (in Thai) of Buddhadāsa Bhikkhu by Nāgasena Bhikkhu. A lecture given on 13th July 2483 (1940). Condensed and freely translated by Nāgasena Bhikkhu. Bhikkhu A. Dhammananda, Wat Mahadhatu, Bangkok, 2507 . 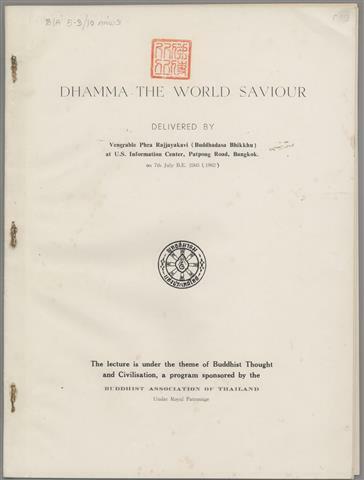 50 p.
Dhamma – The World Saviour by Venerable Buddhadasa Bhikkhu. A Dhamma lecture given on 7th July 2505 (1962) at US Information Center, Bangkok. A Dhamma lecture given on 13th July 2483 (1940). 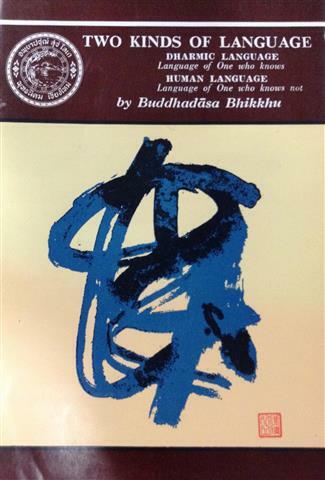 Condensed and freely translated by Nāgasena Bhikkhu. Buddha Nigom, Chiengmai, 2509 . 50 p.
The Right Approach to Dhamma by Buddhadāsa Bhikkhu of Mokkhapalārāma, Jaiyā, Southern Siam. Address to the Eighth World Fellowship of Buddhists Conference on 8th November 2509  at Buddhasathan Hall, Chiengmai, Northern Siam. Translated from the Thai by Sulak Sivaraksa and Don Sweetbaum. Printed by Siva Phorn, Bangkok, n.d. 15 p.
Extinction Without Remainder by Buddhadasa Bhikkhu of Thailand. Christianity and Buddhism (Sinclaire Thompson Memorial Lecture Fifth Series) by The Venerable Bhikkhu Buddhadāsa Indapañño. 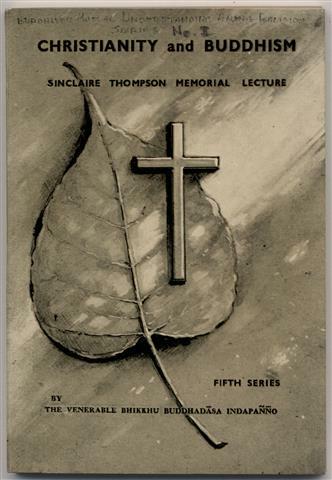 Three lectures ("Christianity and Buddhism," "Father, Son and Holy Spirit," and "Redemption and Consummation") delivered at the Sinclair Thompson Memorial on 18-20 February 1967 in Chiang Mai. Translated from the Thai (ธรรมะกับนักศึกษา) by Ariyananda Bhikkhu (Roderick Bucknell). Buddha-Nigama Association, Chiengmai, 2511 . 73 p.
Condensed and freely translated by Nāgasena Bhikkhu. Sublime Life Mission, Bangkok, 2511 . 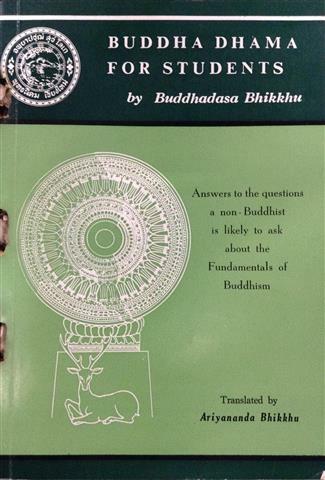 50 p.
Translated from the Thai (คู่มือมนุษย์) by Ariyananda Bhikkhu (Roderick Bucknell), edited by Nāgasena Bhikkhu. Buddha Nigama, Chiang Mai, 2512 . 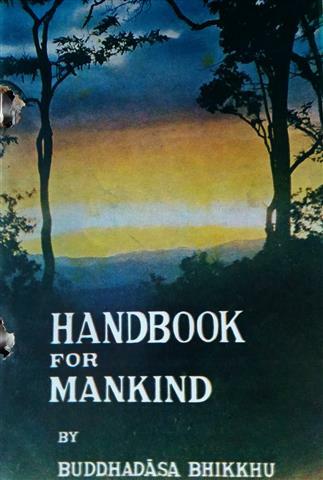 157 p.
A lecture given at the 9th General Conference of The World Fellowship of Buddhists on 15th April 2512/1969 in Kuala Lumpur, Malaysia. 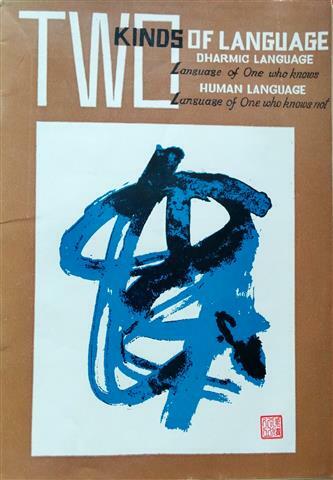 Typed set distributed at the 9th General Conference of the World Fellowship of Buddhists, Kuala Lumpur, 1969. 21 p.
Exchanging Dhamma While Fighting by Ven. Buddhadāsa Indapañño Bhikkhu. 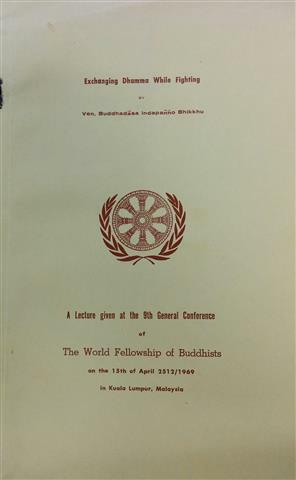 A lecture given at the 9th General Conference of The World Fellowship of Buddhists on 15th April 2512/1969/1388 in Kuala Lumpur, Malaysia. 'Mutual Understanding Between Religions' series No 10. Sublime Life Mission, Bangkok, 2512 . 38 p.
Condensed and freely translated by Nāgasena Bhikkhu. Sublime Life Mission, Bangkok, 2512 . 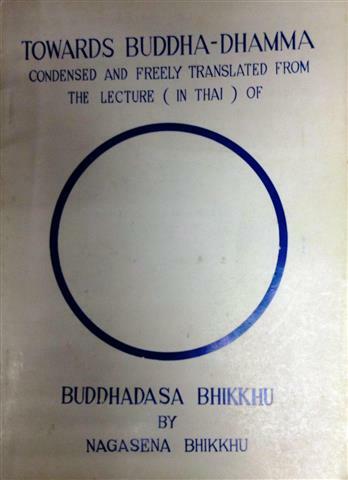 50 p.
Translated by Ariyananda Bhikkhu (Roderick Bucknell). Sublime Life Mission, Bangkok, 2512 . 43 p.
Translated by Ariyananda Bhikkhu (Roderick Bucknell). Buddha-Nigama, Chiang Mai, 2512 . 43 p.